Monarch butterflies are in a race against time during fall migration. They must leave the north before they're trapped by the cold. Monarchs are cold-blooded so, in order to fly, their flight muscles must be warm enough. 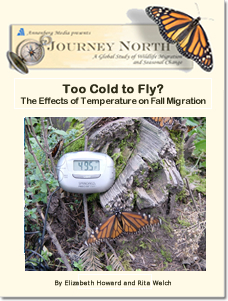 How do temperatures affect fall monarch migration?